Two reviews in one day? What kind of sorcery is this? Our next review comes from a title that released at the end of last year for the Nintendo 3DS eShop. It's a sequel to a WiiWare game, though this one has a different structure to it. Is that new structure for the better? Find out with our review of Fluidity: Spin Cycle (known as Hydroventure: Spin Cycle in PAL territories). Back in 2010, Curve Studios developed a game under the supervision of Nintendo known as Fluidity (or Hydroventure for our PAL pals). 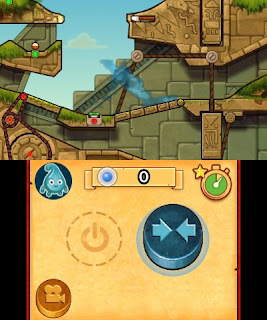 The game released on WiiWare, and it involved tilting the Wii Remote to guide a pool of water through a multitude of cleverly designed areas. Two years later and Curve Studios returned to the franchise, this time with a release on the Nintendo 3DS eShop. Fluidity: Spin Cycle is the sequel, and I couldn't be happier to see the little droplet of water that could return to create a new franchise for Nintendo. Is Fluidity's sequel for Nintendo 3DS one that you'll want to take out for a spin? The "flow" (if you will, har-har) of Fluidity: Spin Cycle has changed immensely from what players got from the WiiWare original. The first Fluidity was very Metroid-like in structure. As you unlocked new abilities, you were granted access to new areas. However, Fluidity: Spin Cycle forgoes this gameplay structure for something more suitable for handheld play. Instead of one huge open world to explore, Spin Cycle is divided up between bite-size levels with the goal of reuniting the male hero with the female water droplet in captivity. Levels are ingeniously designed, and each introduces a novel concept to the gameplay. You're essentially always interacting in some with the environment as your pool of water. One level has you switching between your water form and ice form to bring a load of treasure from the depths of a castle to the first floor. Others have you sliding over the backs of dinosaurs, using your water to carry gears over to their rightful slots, and some even have you needing to twist and turn your 3DS 180 degrees to play (more on these levels later). solving puzzles and defeating enemies. Each of the game's four worlds ends with a boss level. These are quite clever in how they are designed. For instance, let's talk about the first world's boss. It's a giant spider that spews flames at you. By activating a switch, one spike pops out of the walls on each side of the boss. By tilting the 3DS left and right you can make the spider swing into the spikes to damage its hard shell, eventually weakening it enough that you can enter inside the spider and self-detonate to destroy it. These boss fights add to the immense variety of Fluidity: Spin Cycle. This first boss fight is seriously creative. 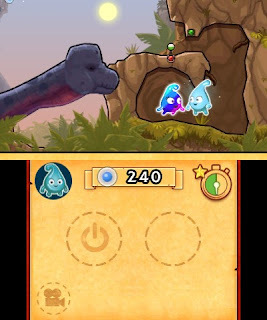 Outside of simply beating levels, which is a task in and of itself, there are two other things that players can do in the majority of levels in Spin Cycle. For one, every level outside of boss battle levels contains a usually well-hidden jigsaw puzzle piece. It will take most of your cunning to find them, and some of them require returning to past levels after a new power of your hero has been unlocked. In addition to puzzle pieces, completionists can look forward to trying to get five stars on each and every level in the game. 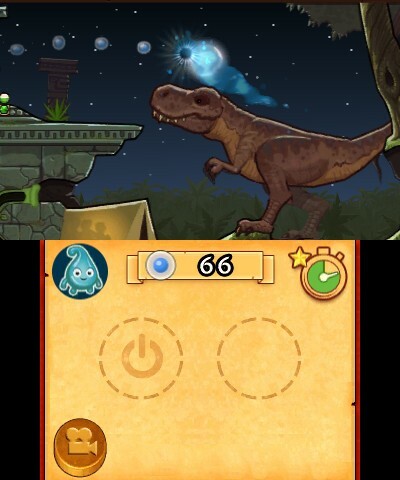 That's no easy task, as you have to not only collect water orbs to add to your score, but you have to beat levels fast enough so you are awarded a time bonus. These added objectives increase the replay value of Fluidity: Spin Cycle by quite a bit. Give that stinky T-Rex the bath it deserves! 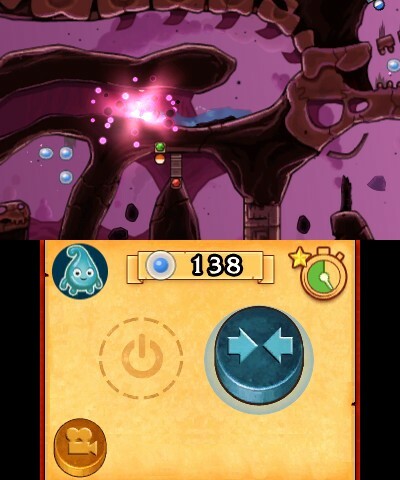 Your water droplet hero learns various new moves, abilities, and powers throughout the course of Spin Cycle. 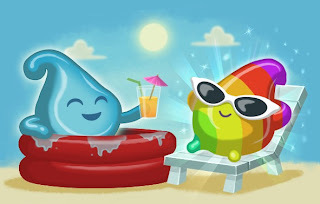 For one, you can gather your water into one spot so you have more control over your entire puddle of water, and in this form you can later learn the ability to explode, destroying nearby weakened walls and other objects. Like the original Fluidity before it, our favorite water droplet (unless you love Dewy from that one Wii game) can freeze his body, turning into a cube of ice. This allows him to step on and trigger pressure switches to open new areas. Those who played the original Fluidity should remember that momentum was the name of the game, as well motion controls. This has, for the most part, remained unchanged with the sequel. However, instead of tilting a controller, you're tilting the entire Nintendo 3DS system with Spin Cycle. What may bother some players is having to turn their 3DS upside-down in the levels that require 360 degree movement. It's quite uncomfortable to hold the 3DS the nontraditional way, and this is especially true when you have to use the face buttons for various actions. On my O.G. 3DS I found myself sometimes accidentally pressing the power button, totally losing any of my current progress in a level. That said, if one can adapt to these controls, one will find a worthwhile game. Don't get dizzy spinning that 3DS of yours around! Fluidity: Spin Cycle is a treasure to look at, and much improved from its predecessor. Worlds are more colorful, they have much more going on, and characters and enemies animate well. Given that you have to tilt the 3DS, the stereoscopic 3D in the game is unused. On the sound side of the equation, Spin Cycle sports a relaxing soundtrack that is definitely one that players can hum to as they play and replay the game's many levels. Overall, Fluidity: Spin Cycle is a big improvement over its WiiWare older sibling. 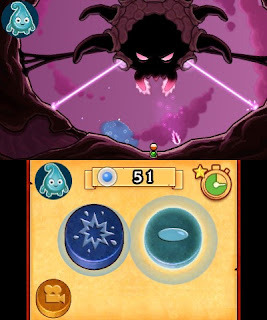 The bite-sized levels work wonderfully on a portable, the replay value is definitely there (through finding puzzle pieces and earning a five star rating on every level), and the controls are responsive, even if holding the 3DS upside-down isn't the most comfortable thing to hold in the world. I wholeheartedly welcome Fluidity: Spin Cycle to those who enjoy puzzle-adventure games, those who like innovation, and those who are yearning for something really cool and different on the Nintendo eShop. If you have an interest in Fluidity: Spin Cycle but have not yet picked it up, I have but one thing to say to you (Warning: bad pun approaching): Water you waiting for? !